Tranquil Hideaway Minutes from the city! 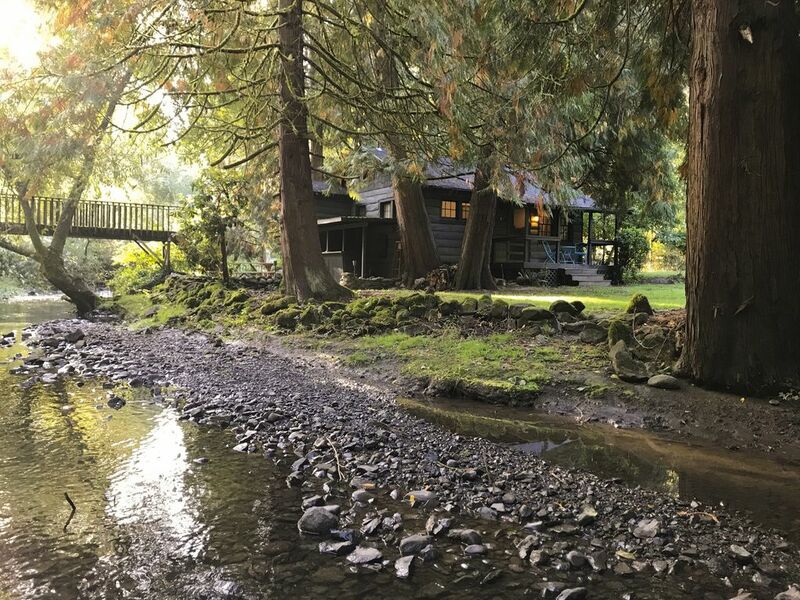 This tranquil hideaway feels like you're in the middle of the forest, but is just minutes from Portland. Relax next to the burbling creek surrounded by towering cedar trees. The MAX Orange line and downtown Milwaukie are only five minutes away. Built in 1928, the cabin has one bedroom and bathroom, living room, full kitchen, central heat and a wood stove. The bedroom has one queen bed and an en suite bathroom. There is a pull-out queen futon in the living room. We welcome well behaved dogs. They do need to be supervised and under your control when outdoors. We have a chicken coop on site and recognize that even for the most responsible of dogs this may provide a temptation. We also ask that you do not leave your dog locked up in the cabin for extended periods of time. If you would like to leave your dog on the premises while you are out to dinner or something please let us know in advance so we can meet the dog and see if there is anything we can do to help ensure they are happy while you are gone. We have 3 Bassett Hounds on site that love to meet and great. If your dog is aggressive or has other issues interacting with other animals please let us know and plan to keep them on a leash. All of the candles we have provided in the cabin are LED. You can turn them on by the switch on the bottom. Please do not try to light the wicks as they will not light and will be damaged. toilet, shower, The Bathroom is off of the Bedroom. There are 2 out door Fireplaces available for use on the property. 1 by the creek and 1 on the Patio. Parking for up to 2 cars is available on Site. All Internet in the cabin is Wifi. The Network is "Cabin Guest ext..". Password "relaxation". Has a Futon the pulls down into a queen bed. 4 burner ranger and Oven. Complete set for up to 6 people. The kitchen has a stove, gas range, a sink, a full size fridge and freezer, a microwave, and many cooking implements. If you are missing or needed something please ask. There is a TV in the Living Room. It is equipped with an Apple TV so you may log into your next fix or other streaming account. It also gets local TV channels and has a DVD player. We keep some Guide Books, Cook Books, and fiction Books stocked. Some fun and eclectic DVD's are provided. The outdoor space on the property is shared. There is a lawn in front of the creek and a small pond. The patio by the creek has a Picnic table that comfortably seats 6. Multiple Ski Opportunities on Mount Hood within an hour drives. Multiple Golf Courses are within 15 minutes. There are steps into and around the cabin. Depending on the weather there may be wet soil conditions. It's settled, this is my new go-to accommodation when visiting Portland.